SN 27050 is a J.P. Sauer built Drilling as imported by Manhatten Arms Co, New York. This was a name used by the importer prior to Charles Daly, Schoverling, Daly and Gales. Watson Brothers, London is considered to be one of the better mid range shotguns. This piece has a 30" barrel, rib marked Watson Bros, 29 Old Bond St.
1886 Rifle SN 88387 built in 1894. This piece shows a round 26" barrel, caliber 40-82 with a bright excellent bore. The barrel appears to have been improperly cleaned by a prior owner. For reference see p age 198 of "Remington Rolling Block Military Rifles of the World." 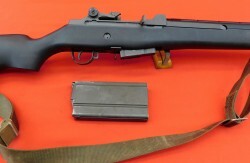 This rifle shows the 7 mm sight as pictured on the above reference. There are no caliber or barrel markings. Excellent plus example of the Model 1889 Swiss Military rifle. This model was the 1st in a series of Schmidt Rubin rifles built and issued to the Swiss Military. Winchester Model 37A 20 gauge, 2 3/4 and 3" chamber, 28" barrel with excellent bore. Built in Canada at the old Cooey plant there is excellent blue on barrel. SN27721K71 is a 308 caliber Browning BLR built in Belgium (1969 to 1973).